Although we ultimately chose another book, Milk Fever was one of the books enthusiastically nominated for the ANZ LitLovers Reading Group schedule for 2011, so when I saw it at the library, I didn’t hesitate. It is Lisa Reece-Lane’s debut novel, and it’s very good. Very good indeed. The narrative is structured around the two central characters, Tom and Julia. We see into Tom’s troubled mind through his slightly distorted first person narrative; Julia’s is distanced a little through a third person recount of her travails. She’s an unhappy woman, and a bit of a martyr. She has good reason to be miserable, but she’s got herself trapped into a habit of acquiescing to everyone else because it’s ‘easier’. Her husband, Bryant, is the sort of tiresome optimist who brooks no disagreement with his self-indulgent plans. He swamps her commonsense objections with relentless exhortations to ‘think positive’ and ‘banish negative thoughts’. They have escaped to the unlovely rural town of Lovely to rebuild their finances – but their maxed-out credit cards have come with them and they are reliant on his dream of running a yoga studio – in a town that can’t support a decent café. Joe thinks for a moment. ‘The pub does all right’. Lovely isn’t Daylesford or Woodend with a dynamic café and artistic culture. It’s one of those sad towns defeated by the drought and depopulation that are bypassed by the Hume Freeway altogether. And yet it turns out to have compensations. I’m not going to ruin this book for anyone by saying what they are because this is a plot-driven book and its readers deserve the pleasure of discovering all kinds of interesting rewards. I’m impressed by Reece-Lane’s mastery of quirky characterisation, and the mature wisdom she brings to the interplay between her creations. There is desire, jealousy, discontent and love, but more than that, this is a novel about the vulnerability and passions of ordinary life that isn’t ordinary at all. 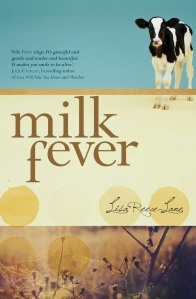 If you liked Toni Jordan’s Addition, or Rosalie Ham’s The Dressmaker, you will enjoy Milk Fever. And it’s very difficult to put down. I started reading it last night, and I finished it this morning, wishing there was more. Reece-Lane has a chatty blog called Milk-Fever, but I hope her current writing includes working on a new novel. Interesting review Lisa. I hadn’t heard of this book. It sounds good though. I’m glad you got a chance to read it and blog it.